Are you fascinated by the prospect of indoor gardening? Well then, what’s stopping you from taking the next step? Maybe, you are drowned by the pool of repetitive ideas that discourage you from being truly enthusiastic about indoor gardening. Gladly enough, the game changes right here. This list article covers a myriad of creative gardening ideas that can forfeit any self-defeating indoor gardening thoughts which you may have until now. So, let’s forget the hustle and bustle of daily life for a brief while so that your worthwhile desire for indoor gardening doesn’t go unpursued. FYI, this list comes not only with texts and images but also a relevant video that will probably improve your learning experience. Play for view second and try. If you don’t like it, you can always pause it later and continue with the list. If space is a premium commodity for you, this hanging garden should be in your bucket list. As you can tell from the image above, this vertical indoor garden can house a bunch of plants without killing any usable space in a property. Oh yes! It never fails to add an extra spark to any home décor you can think about. To create the shelf for the plants, you need to measure and cut the wood for the pots to sink into the wood. Then, drill holes on the corners to slide the rope through the holes. Finally, you need to add your favorite plants to the garden. Last but not the least; you merely have to sit back and watch your indoor garden flourish! This upcycled light bulb planter looks like a piece of art. Frankly speaking, it’s hard not to fall in love with something as simple and creative as this indoor gardening idea. If you want to go green in your home, give this beauty a shot on any given day of the week. The fruits of labor would be highly rewarding. To begin with, get a couple of bulbs from a local store. You need a non-functional bulb, so get rid of the black glass on the top. Break the inner glass seal and remove the fill tube as well. Now, the bulb is ready for plantation. Drill holes on the silver area of the bulb with gentle pressure to attach the strings. Once done, place your favorite plants in the bulbs and hang them anywhere you like. Why not reuse an old aquarium and turn it into a praise-worthy miniature garden? It’s an amazing DIY project to show your love for plants. What’s so cool about this indoor garden is the simplicity to put this thing together. It all starts with filling the bottom of the vessel with small rocks. Next, add a layer of charcoal to avoid things from getting smelly. Then, you need to add a layer of sand to it and put the plants into it. That’s it. Keep it at your desk for a wonderful company. This garden wall can unintentionally put professional makeover projects to shame. Believe it or not, it will literally change the dynamics of a space. Frankly speaking, any blank wall in your room that needs beautification should fit the bill for this indoor gardening project. Create square planter boxes and attach them to the plywood using screws. Drill holes at the bottom area of the individual boxes for water drainage. Fill the boxes with sand and stones. Finally, add plants in them. You won’t believe how many plants you can grow in this DIY garden wall. 16. Air Plants + String Art = Living Wall Art! If you would like to try something new, go for air plants indoor gardening. For those who don’t know, air plants are incredibly easy to keep alive. With some degree of creativity, they can look amazingly cool. So, why not display them? To show off this living wall art, you will have to draw a design on a board and mark areas where the nails will go. The design could be a plus sign, triangle, or something else. Then, hammer the nails and tie strings from one nail to another in a pattern. A design will evolve to hold the plants. Place the plants and enjoy the spectacular look. There is something distinctively gratifying about indoor flowering. The sheer look of them provides intellectual joy and satisfaction (also leaves us breathless sometimes). Not to forget the fact that flowers are easier to grow indoors compared to other plantations. They are a perfect commodity for small spaces too. So, let’s take a shot at the Test Tube Vase Chandelier that will fulfill all your must-haves from indoor flowering. For this ingenious DIY indoor gardening idea, you will need 6 hanging test tube vases, 3 meters of leather cord, and a metal circle frame. To suspend the tubes in the air, you need to cut two pieces of string (approximately 20 inches) and tie them into the metal frame on each side to create a cross style hanger. Next, you need to cut a piece of string (approximately 8 inches long) and tie one end into the test tube vase, and the other end to the metal frame. This needs to be done for all the 6 vases. Once done, they are ready to be hanged. Add water and place flowers in them. Finally, pat your back for completing this incredible floral project. The Mason jars terrarium fever is catching up like nobody’s business. They add a fresh aroma to any home décor. The best part is that they are amazingly fun and ridiculously easy to create with minimal supplies. So, let’s put your mason jars to some creative use today. Prep the jar by washing and drying it. Then, add a layer of rocks and moss for drainage. Add a few inches of soil as well. Next, add a final layer of moss. Finally, dig a small hole in the soil to add your plant. Three layers of shelves and you have a spectacular piece to add to your indoor garden. Perhaps, there’s no better way to take your garden from the wall to the floor. For this little greenery and stylish look, you don’t need a lot of supplies either. Cut the timber to create actual floating shelves, wrap them into copper sheets, drill them into the wall, and plant the trees. The final product will look amazingly cool. And, no one will know that you didn’t throw an arm and a leg to create this beauty. Enjoy all the bragging rights for this effortless project. Cacti make a great household plant. They are easy to grow. Plus, they don’t demand a lot of water. They are sun-lovers and slow growers. As long as they can get a lot of direct light, they will blossom your space like nothing else out there. So, you can easily decorate your home or office with this plant. To bring nature to your home, let’s get to the meat of this DIY project. Take a wide vase and add some rocks at the bottom to help with water drainage. Add few layers of soil (about an inch from the top) and add a bunch of cacti plants in the soil. o, go for variety over here. Finally, cover the top with a thin layer of cute rocks for the cool look. By no means, you won’t feel like not bragging about this adorable creation. For a well-curated modern display of indoor gardening, this creative piece should win an excellence award. It’s a perfect display piece for small spaces. Moreover, it can be created with little means without any hiccups. Overall, this miniature garden is functional, beautiful, user-friendly, and budget-friendly, all at the same time. You will surely lose track of time creating this wonderstruck beauty. 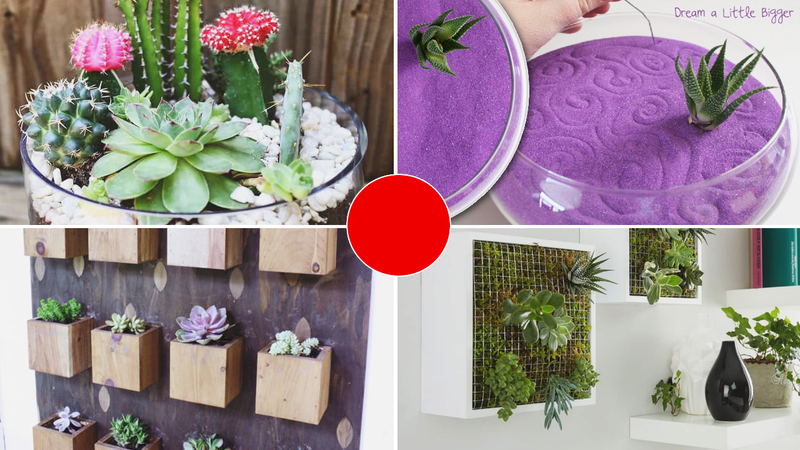 All you need is a glass dish, a piece of cloth, a cactus plant, and colored sand to nail this project like a pro. Fill the cloth with sand to plant the roots of the plant into it and insert the plant into the colored sand. Keep in mind that you have to insert the cloth bag deep inside the sand to make it literally invisible. Make sure to tie the mouth of the cloth at the base of the plant. For the final touches, make a good sketch on the sand. You will be amazed by how nice and charming the whole thing will turn out! This DIY project depicts a green wall at its best. For a lush green garden on the wall, you won’t find a better alternative. In fact, it won’t be an understatement to claim that this vertical wall garden makes an unmatched statement on its own. Not to forget the fact that the concept of ‘green wall’ has been picking up like wildfire these days. So, why not try this thing out? Select the space for your personalized green wall. Then, build a frame with the necessary raw material (shelf and grid). You will have to cut the grid in the right size to fit it into the shelf. Using a hammer and few nails, attach the grid into the shelf. Then, attach the frame to the wall, and add a layer of moss and soil. Finally, sit back and witness the plants live and grow in your living room. If you are looking to build a flashy wall hanger that doesn’t break your budget, the Brass Himmeli Hanging Planter should be on your immediate wish list. It’s beautiful, inexpensive, and it adds an element of fine furniture to any home decor out there. So, this indoor hanging garden idea is definitely worth a shot for someone looking to change their home aesthetics for the good. A brass wire, brass tubing, planter, and pipe cutter would be needed to kick-start this project. To begin with, cut the brass tubing into small pieces to form a base where the planter will rest. Join them at the tip to make a triangle shape. Feel free to play with proportions and connect the pieces together to create a cage. Use the brass wire to hang the planter at the desired height. House a small plant in the bowl and place the Himmeli hanger and hang it at a secure place. Just make sure to keep it out of children’s reach. If you are itching to lay your hands on this awesome DIY creation, then you would be happy to learn that anyone can create this spectacular item in the middle of a regular day without frying their brains. As you can tell from the image above, it features a unique body, and it has a touch of a modern look to it. To give life to this beautiful creation, let’s dive into the steps. Start by polishing the copper air chamber with vinegar and salt. Then, cut a piece of plywood and simmer the plywood for few minutes and allow it to dry before wrapping it around the chamber. Secure it with rubber bands. Now, lay the air chamber at the center of the candle plate and wrap it with wires. Add your favorite stem, fill some water, and fix it on the wall. You will feel like you kicked out the wonderful artist in you. This is a cute DIY project that even a nine-year-old can do. Moreover, this easy-to-do stamped herb pots can look good on any countertop. If you plan on trying it out, here are the steps to create this functional piece of art. Get some white pots and tape them with letter stamps. Of course, allow them to dry. That’s it. You are done! Didn’t you find it unexpectedly easy? But, don’t let the easy task fool you. These will turn out to be wonderful decorative pieces for your home. Jump on the indoor gardening bandwagon in style by creating this succulent planter at the comforts of your home. The stuff looks amazing, and it keeps things interesting in your space. Therefore, it could be your next idea for creative indoor gardening. In fact, it may turn out to be your absolute favorite. The best part is that it’s easy beyond means to create this succulent planter. All you need to do lay popsicle sticks in the shape of a hexagon. And, glue them to complete the hexagon. Continue layering it until it’s deep enough to place your plants into. Add several layers at the bottom to completely block one side of the hexagon to allow it to accommodate sand and the plant it needs to grow. That’s it. Your cutest indoor gardening décor is ready to be admired. This green wall has a majestic look to it. Upon completion, this DIY project can make you feel like the smartest person on the face of this planet. Frankly speaking, it can make an ordinary wall look ultra-awesome in a jiffy. Enough said! Let’s give you a brief overview of the steps to create this indoor gardening marvel. So, get ready for this awesome project. Start by cutting long boards to finish the frame (as seen on the image above). Secure the frame on the wall with nails. Acquire some planters on clearance sales and spraypaint them. Create a snug fit leather planter holder to hold the planters on the frame. Once the leather straps are ready, attach them on the frame and fill them with your favorite plants. The plant lover in you will absolutely thank you for the effort! If you love hoarding plants, this is another indoor gardening project that should catch your interest. It’s a project of effort and creativity that can garner a lot of eyeballs. As you can tell from the image above, the leg portion of this DIY project really stands out. It can be created with no legs at all, but it will lack the appeal it has. As such, the legs are planted on a simple wooden bottom. Three angled plates are used to attach the legs to the wooden surface. Once the base is ready, you can glue the planter on the wooden surface. Add cactus soil and white sand on top of the soil. Finally, plant the cactus and enjoy your work! Looking for a nice table top for indoor gardening? Your prayers have been answered. In this DIY, you will be a creating a customized table that’s both modern and inviting. Of course, it won’t break your bank either. Not to undermine the fact that it would prove to be a fitting addition to any entry. Start by cutting three wood boards into equal length, width, and height you need the final table to be. Lay them side by side and glue them together. Use three smaller boards and screw them on the board at equal distances once the glue dries off. Next, attach the hairpin legs at the corners of the board. Finally, add a new plant pot on the top and admire the self-made entryway table. To add more greenery to your life and living space, you can afford to go nuts over this offbeat Macrame plant hanger project. You will enjoy the challenge involved, and you will fall in love with the final outcome even if you have zero DIY skills to bring to the table. Yes, this project won’t prove to be a massive effort-fest. Some labor and creativity will do the trick over here. Basically, you will have to create basic macrame knots to hold the plant pot. So, you will need a macrame cord, metal ring, and a scissor to execute this project. Once the knots are ready, you need to place the planter and hang it up at the desired spot. You can hang this little fellow in any corner of the room. Of course, make sure that the ceiling can handle the weight of the plant. The next time you invade your kitchen, keep in mind that some of the kitchen leftovers can come really handy in indoor plantation. So, think twice before you start dumping some of the usual kitchen stuff. For instance, you can use leftover lettuce, green onions, celery, etc, to devise your indoor garden from kitchen leftovers. Cut lettuce 2 inches from the bottom and transfer it a glass bottle filled with a tad bit of water. Wait for a week before you transfer it to the soil. The same can be done with green onions or celery. You can also take mint and basil leaves. Cut them 3 inches from the top and transfer them into a glass filled with a tad bit of water. When the roots grow about 2 inches, transfer them to the soil. You can use any wooden frame that can hold sand to transfer these plantations to the soil. Isn’t this a cool green living kitchen practice?